Osteopathic treatment for arm, elbow and shoulder pain. Through a thorough examination, osteopaths find and treat the root cause of your problem to relieve your pain and improve your mobility. 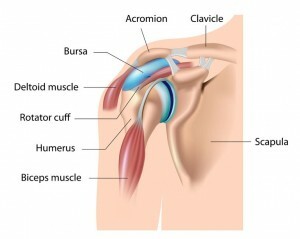 Anatomy of the shoulder joint. This occurs when the capsule (loose bag) around the joint sticks to itself and becomes inflamed. 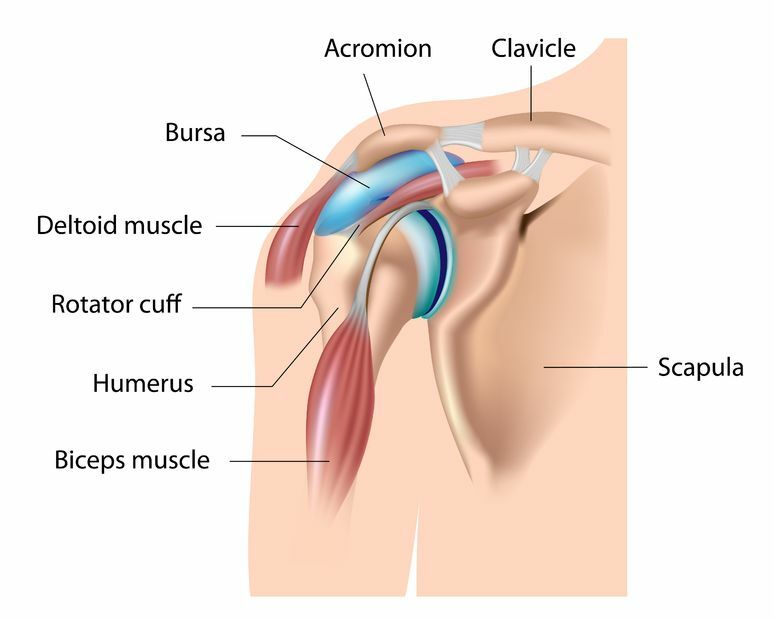 The shoulder literally feels “frozen” and has very limited movement and is often very painful. Read the Frozen Shoulder (Adhesive Capsulitis) Case Study. Osteopathy can help to relieve your shoulder pain and improve mobility whilst the capsule heals. Frozen shoulders do take a while to settle down but treatment can be very helpful to manage the symptoms during this time and will include exercise and advice for self-help at home to maximize the recovery rate. Getting the right advice early on is vital to starting the healing process. Pain and or swelling around the side of your elbow could be caused by an inflammation of the bone where the muscles of the forearm attach. It is often caused by some sort of repetitive action, not necessarily golf or tennis – gardening or decorating are common things which set it off too or it can be part of a repetitive strain injury (RSI). 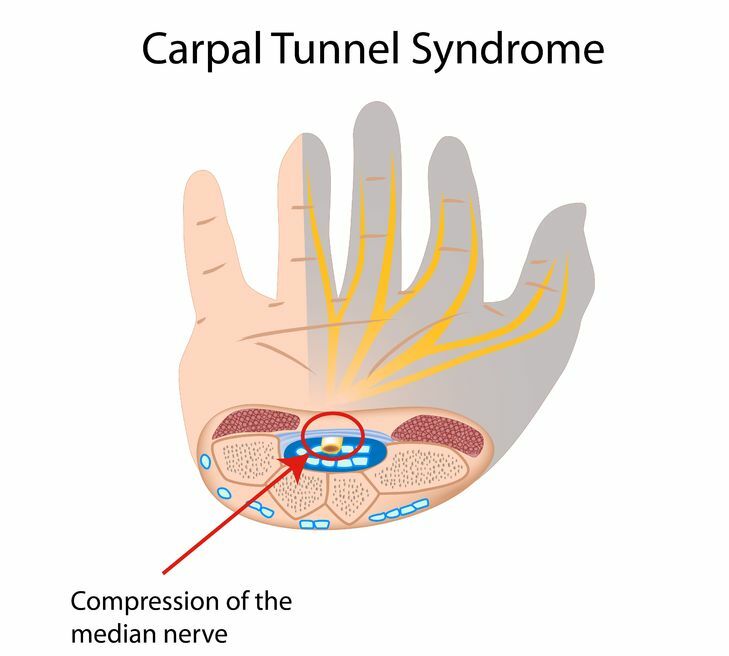 Wrist pain, hand pain and weakness can be the result of several causes including wear and tear (Arthritis), repetitive strain injuries (RSI), carpel tunnel syndrome or Sports Injuries. 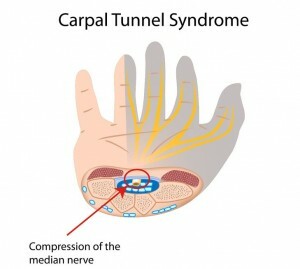 Osteopathy can help with wrist and hand pain, firstly making an assessment of the exact cause of your symptoms and then, if appropriate, treating with soft tissue massage, joint mobilisations to reduce your pain and improve mobility. Advice can be given about exercise and self-care tips to assist your recovery. Osteopathy is a physical therapy which uses manual (hands-on) techniques to diagnose and treat structural and mechanical dysfunctions of the body, without the use of drugs or surgery. Soft tissue massage, joint and muscle stretches are used to improve range of movement and reduce pain and stiffness in the muscles, joints, bones, ligaments, tendons and nerves. Arm, elbow and shoulder pain.